I'm a huge fan of Nintendo's strategy RPG series Fire Emblem. In fact, I'm just a fan of well done SRPGs (strategy role-playing games). Unfortunately not many get translated to English; just look at the Super Robot Wars series. The lack of new SRPGs and the fact that I had to wait a month for Fire Emblem had me searching for something "new" to fill the void, and that was how I came across Sword Requiem by Chinese game developer JoyMaster. While Sword Requiem has captured my attention and time, it sadly isn't Fire Emblem. At first look, even before you start the game, Sword Requiem looks very similar to every asian styled hack and slash "RPG" found on Google Play and the App Store—games such as Inotia and Zenonia. However Mama Jou always said to look beyond the surface, so I decided to try Sword Requiem out, and to my honest surprise it actually was an SRPG that my mobile device desperately needed. The game takes place in a medieval fantasy world where people fight with swords and magic. The world is under turmoil and war is about the break out between the nations. The main hero, Siegfreid, or Igfreid, wakes up with amnesia and is whisked away to save the kingdom with a group of dedicated warriors. Sounds lovely. 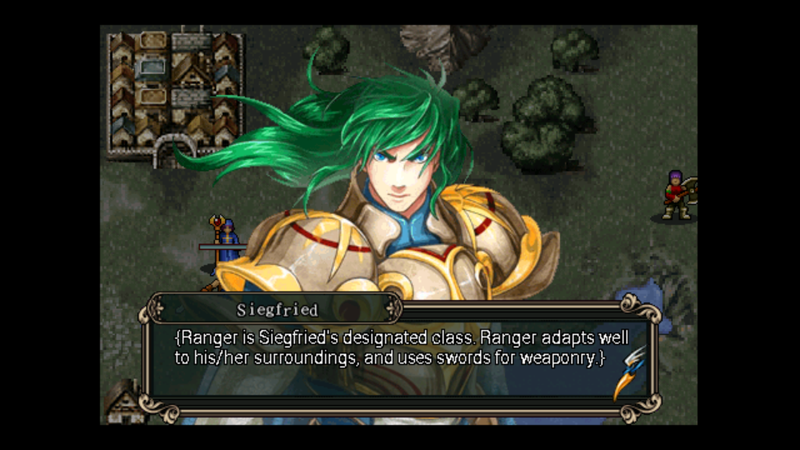 Generic story aside, Sword Requiem plays exactly like Fire Emblem, so much so that I would call this a direct clone. Like in Fire Emblem, gameplay takes place on a huge chess board. The player can move units every which way during the player turn and then the AI moves. Heck, even the battle animations scream Fire Emblem. Unfortunately for Sword Requiem, it's not Fire Emblem. Part of what made FE so great was the rock paper scissors weapon system where swords beat axes but lost to spears, and axes beat spears. This dynamic is lost on Sword Requiem, making the game more of a regular beat'em up tactics game. All you have to do is swarm a unit and beat it to death—there isn't much strategy on that front. Chinese fans were also quick to point out the similarities between Sword of Requiem and Fire Emblem. One user of Chinese app download site Char009057 says that the game is "just a Shanzhai version of Fire Emblem". Another commenter, Cairnan, agreed, saying that the game, despite not being Fire Emblem, holds its own as a simple SRPG. Luckily one feature that Sword Requiem did include was the controversial "Perma-Death", where characters that die are gone forever. In the first two missions of the game, basically any character dying means a game over. However, despite the addition of the perma-death feature, one can save after every move, which kinda defeats the whole point of perma-death—if my character's going to die, I can just load an earlier save. The game also lacks the polish of Fire Emblem. Visually it looks too much like a Gameboy game, and on top of that, the screen is cluttered. The menu button is on the screen at all times, creating an unnecessary eyesore. What baffles me the most is that the game doesn't take advantage of the whole screen real estate that it's given. I'm playing on a 4.3 inch screen but on both sides I get black bars, creating virtual dead space. Oh, I almost forgot to mention: the game is available in both English and Chinese!